Over the years, two key techniques have emerged as the most effective for finding security vulnerabilities in software: Dynamic Application Security Testing (DAST) and Static Application Security Testing (SAST). While DAST and SAST each possess unique strengths, the "Holy Grail" of security testing is thought to be "hybrid" - a technique that combines and correlates the results from both testing methods, maximizing the advantages of each. Until recently, however, a critical element has been missing from first generation hybrid solutions: information about the inner workings and behavior of applications undergoing DAST and SAST analysis. This white paper explores the next generation of hybrid security analysis - what it is, how it works, and the benefits it offers. 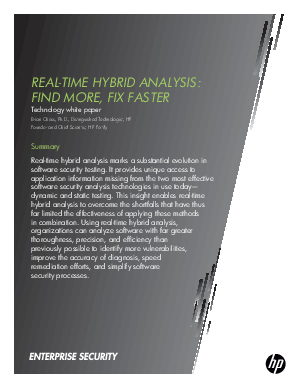 It also addresses (and dispels) the claims against hybrid, and leaves you with a clear understanding of how the new generation of hybrid will enable organizations to resolve their most critical software security issues faster and more cost-effectively than any other available analysis technology. Tags : "application security", cyber-attacks, software security assurance, dast, sast, security breach, data breach, owasp, software vulnerabilities, critical application vulnerability, hp fortify, aberdeen, sdlc, mobile security, on-demand solutions, software-as-a-service, saas, it security, alm, "application lifecycle management"